I discovered one of our ornamental trees had a split crotch where two larger branches met. To cut off one of the branches or the whole part of the trunk completely would ruin the balance and asthetics of the tree. I needed to figure out a way to hold them together long enough without girdling the trunk so that the split could heal. If you have a split ornamental or fruit tree that you want to save, this is one way you can do it. ASSESS SPLIT -- Is there enough bark on each side of the split? If not, then the side with little or no bark will eventually die, since the part directly under the bark is what feeds the branches and leaves. Are you able to pull the two sections back together? This will be necessary to keep it from splitting further and to allow the tree to heal over the wound. 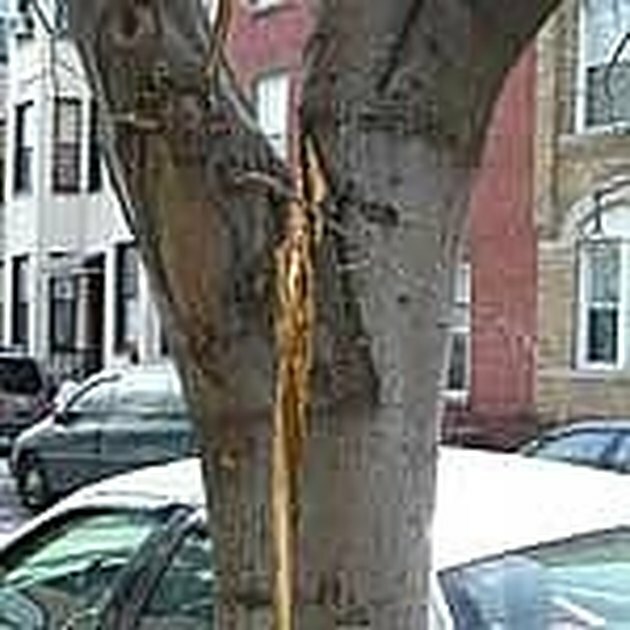 In my case, the split was fairly recent and there was plenty of live bark on either side. DETERMINE SUPPORT -- You need to be able to force the split back together somehow, and hold it in place for several years as the tree grows around the split. 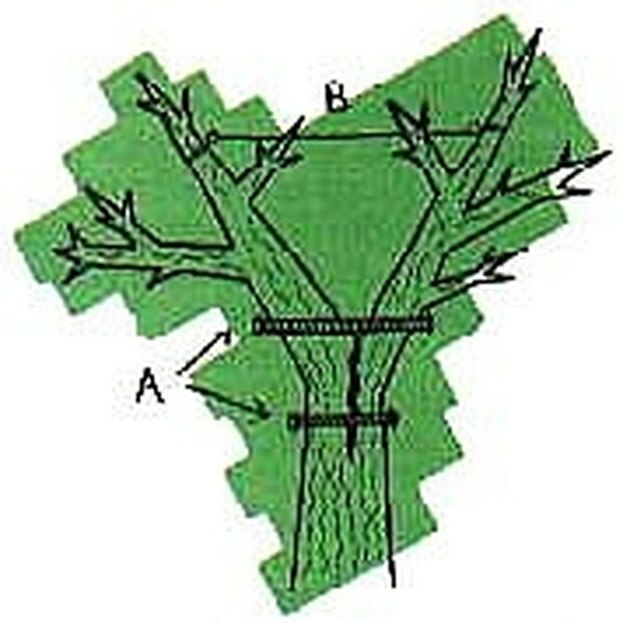 For larger trees, you can do this with a winch and rope or cables (B) to winch the halves back together above the split. Then you can drill through the split and install threaded steel rods (A) with washers and nuts at either end to clamp the split together. The tree will grow around/over the rods eventually. In my case, this was a small 3" diameter Redbud tree. 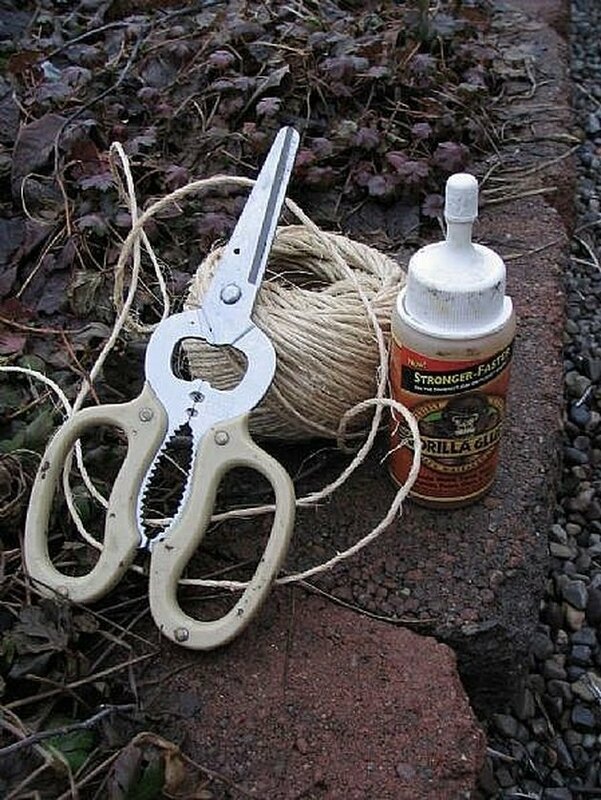 I could use garden twine to pull the halves back together again. But how to hold it in place? I decided to use 'gorilla glue' in the split. That should hold it for a while, and some twine above the split could provide a little more support for the first year. APPLY GLUE -- With the support method determined, I opened up the split and used a popsicle stick to apply the glue to both sides of the split. You can see the glue starting to expand and fill in the space in the picture. PROVIDE SUPPORT -- Then, I tied the branches above the split so that I could pull the split back together so that the glue can cure. I wrapped some twine around the trunk temporarily while the glue sets up and hardens. I will remove this in a day, since I don't want to girdle and kill the tree. 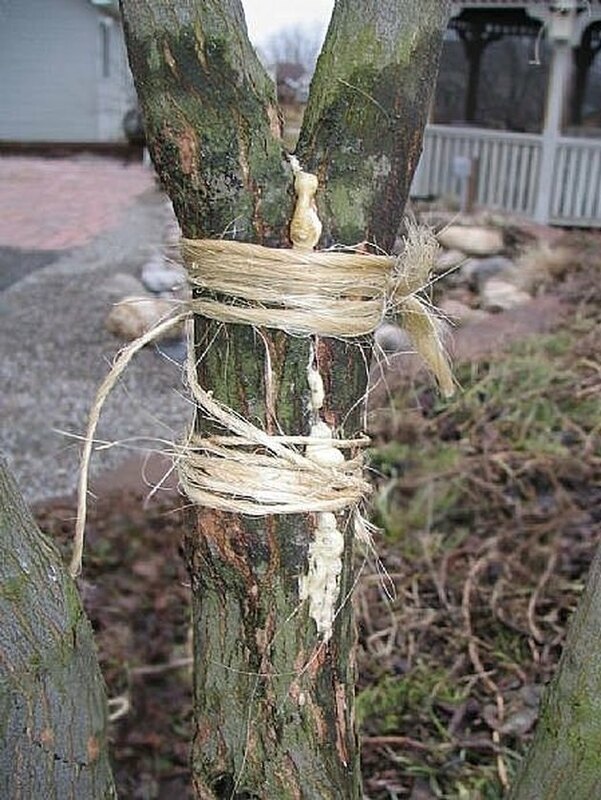 The twine above the split will stay on for a few weeks until I know the glue will hold -- it's tied around the branches and I don't want to girdle them either. 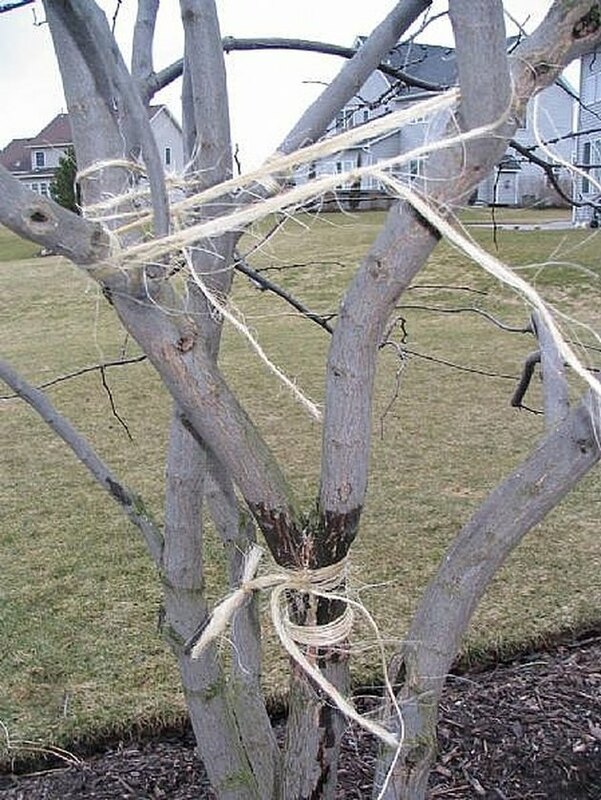 I will apply another rope or twine around the same branches later, only not tied all the way around each branch.